There are two main reasons why I chose Tufts: collaboration and community. When picking my graduate school, I chose based on the Biology Department specifically. Now, after having been at Tufts for four years, I can say that these two reasons also apply to Tufts in general. Collaboration: I loved that the Biology Department was collaborative, not competitive. Since we are one Biology Department, there is a range of expertise: from DNA repair to animal behavior, there is likely someone that can help with any project you propose. There are grad students that are co-advised and many labs collaborate. I am currently working on a project with the Wolfe Lab, a lab that studies microbial communities in fermented foods! I am working with the Wolfe Lab to determine if honey bee diet affects the community of microbes that live in the honey bee gut. 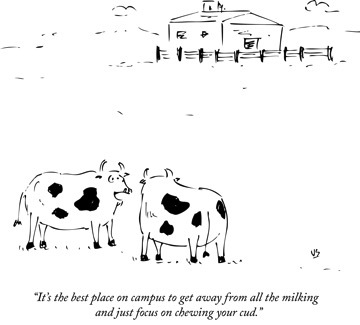 In general, I find the atmosphere on the Tufts campus to be a collaborative one rather than a competitive one. There are opportunities for grad students to collaborate with labs outside of their own department. Tufts even has an internal grant, Tufts Collaborates, which is specifically for this purpose! In my department, I know of biologists who work with chemists, engineers, and computer scientists. Community: Even though we are divided into two buildings, the Biology Department strives to stay united. Every Friday, we have a seminar with cookies and tea before, and chips and salsa after. After seminar, I have the chance to catch up with faculty, staff, and students that work in the other building. Outside of my department, the Tufts Graduate Student Council (GSC) strives to create a sense of community within the grad students. There are monthly GSC meetings where you can meet other grad students, hear about things going on, and voice your own opinions. The GSC also hosts academic, social, and community outreach events. 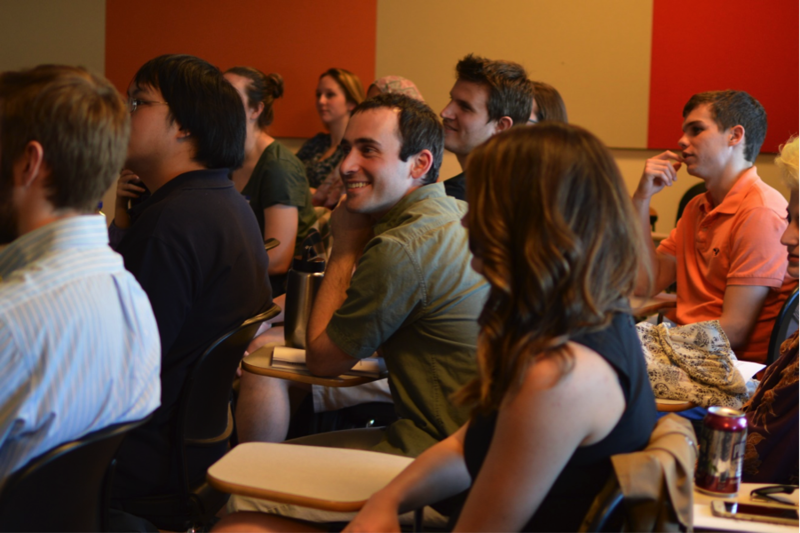 Just last month, the GSC held their annual Graduate Student Research Symposium (GSRS). This symposium is for all grad students on the Tufts University Medford/Somerville campus and School of the Museum of Fine Arts. 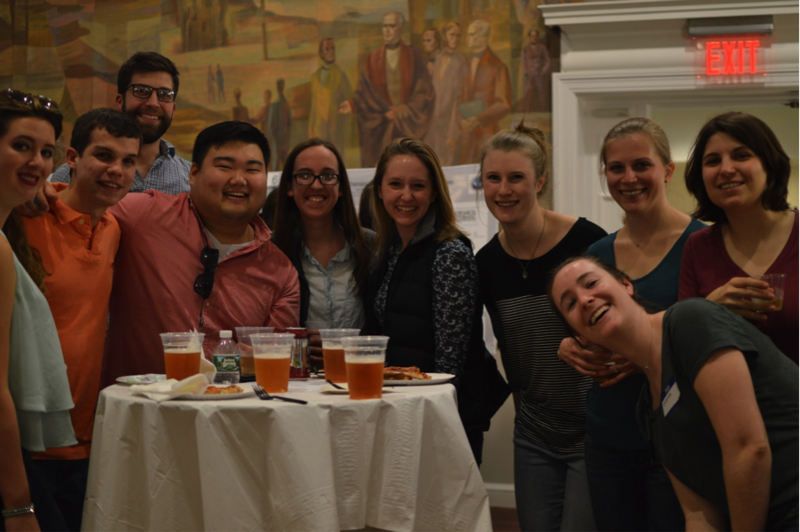 The GSRS is not only a place to meet other grad students, but it’s a place where you can learn about all the cool research happening at Tufts, and maybe find a collaborator! A couple other reasons specific to me: I grew up in a small town and while I enjoy visiting the city, I am not much of a “city girl.” The location of Tufts is great for the small-town girl in me: it’s easy to visit the city but it’s also easy to find beautiful places to hike and enjoy nature. Just about an hour south of New Hampshire and an hour east of Central Mass, there are plenty of gorgeous hiking trails and mountains within a manageable driving distance. Since I would one day like to teach at a primarily undergraduate institution, I also like that Tufts has unique teaching opportunities for grad students. There is the Graduate Institute for Teaching where grad students attend workshops on teaching during the summer, and then co-teach a class with a faculty member during the fall. There is also the ExCollege which awards Graduate Teaching Fellowships for students who want to create and teach a class on their own. This coming Fall, I will be teaching my own class on insect pollinators and applying basic science to conservation practices! Enjoying the talks at the 2017 GSRS. Enjoying the poster session and reception after the 2017 GSRS. Hiking Mt. 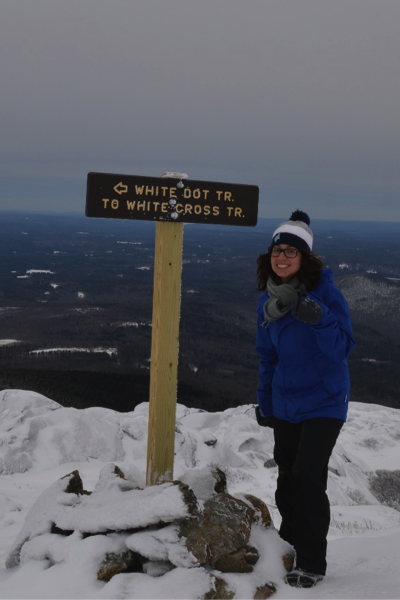 Monadnock in New Hampshire, equipped with my Tufts Jumbos winter hat! This entry was posted in Why Tufts? and tagged collaboration, Community, Graduate Institute for Teaching, Graduate Teaching Fellowships, Hiking on April 7, 2017 by Rachael Bonoan. Where do I study on campus? One of my favorite parts about Tufts University is that it’s both a nurturing liberal arts school as well as a full-fledged research university. What that means for me, as a graduate student, is I can get personalized attention from my professors, collaborate with a smallish cohort of supportive classmates and also take advantage of the vast array of research opportunities that one might expect from a large university. What this also means is that graduate student life can get really really busy! I’m a first year PhD student in Computer Science here at Tufts. I am returning to academia after having worked for a number of years as a lawyer. Long story! So, needless to say, I have a lot of catching up to do. I quickly needed to find cool study spots on campus where I can get my classwork and research done efficiently. Thinking and “ideating”: when I needed ideas and creative insights to solve a homework problem, or explore a research idea. Discussing my ideas with colleagues and classmates: when I needed to talk about by ideas with friends, draw some pictures on a whiteboard and so on. Writing up an idea: when I needed to write up a draft of the paper, code or finalize my homework solution. What I also realized was that these three types of tasks required very different study environments. I discovered that my best thinking and ideating happened in coffee shops, where there is a slight amount of background noise, but not too much to affect my stream of thought. Armed with my favorite micron pen, a yellow legal pad and mug of coffee Tamper (340 Boston Ave.) or Brown and Brew (474 Boston Ave.) or Tower Cafe (in the Tisch Library) can be perfect places to tap into that creative stream of consciousness. Oh, and they also have good coffee! When I need a whiteboard to get my thoughts out there, I always find a spot in the lounge area in Halligan Hall (161 College Ave.) where there are not only whiteboards and chairs, but also other Computer Science students whom I can interrupt in for a quick clarification. Besides, a number of CS grad students have offices in Halligan and working there is a great opportunity for me to get to know my peers better. My own research group, the Human Robot Interaction Lab is at 200 Boston Ave (up the street from Halligan), and I am here a lot too. Finally, when I need to buckle down and code or write up my paper or homework, I find myself escaping into the crypts of the Tisch Library stacks in the lower levels. There are some great quiet-study areas scattered there and can serve as an ideal get-away when I know what I need to do, but just need to get in the zone to get it done. Plus, being surrounded by books can be a great intellectual motivator! This is by no means a comprehensive list of study spots and there are plenty of other spots around campus that Ipek and Rachel have elaborated in detail here and here. 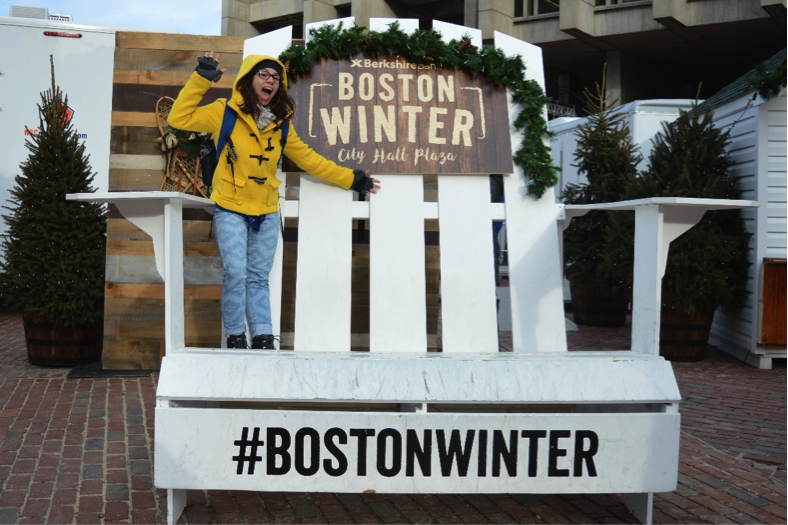 Rachel even suggests study spots matched by personality type, which is really cool! One place I plan to check out next is the Granoff Music Center (20 Talbot Avenue). This entry was posted in Around Tufts and tagged coffee, collaboration, computer science, study spots on February 19, 2016 by gthoma03.